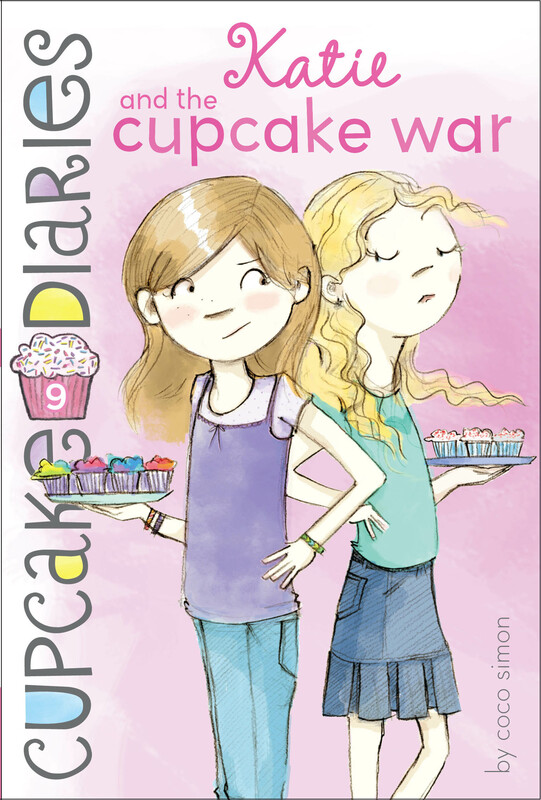 Katie finds the courage to face off with a former friend in this Cupcake Diaries story. Katie and Callie used to be best friends—until Callie ditched Katie so she could join the Popular Girls Club. And even though Katie is now very happy with her Cupcake Club friends, Callie’s mean move still bothers her. Finally, Katie finds a way to confront Callie…but it’s going to take lots of sweet-talking to repair the friendship. CHAPTER 1 You Are Not Going to Believe This! Mia! Is it really you? I haven’t seen you in a gazillion years!” I cried, hugging my friend. Mia laughed. “Katie, I was only gone for, like, four days,” she said. Actually, I was kidding. Mia looked pretty much the same, with her straight black hair and dark eyes. She might have gotten a little bit tanner from her long weekend at the beach. She was wearing white shorts and a white tank top with a picture of a pink cupcake on it. Then the doorbell rang. It was Emma and Alexis, and what they were wearing proved my point. Emma is a real “girlie girl,” although I don’t mean that in a bad way, it just describes Emma really well. Pink is her favorite color, and I don’t blame her, because pink looks really nice on you when you have blond hair and blue eyes like Emma does. She wore a pink sundress with tiny white flowers on it and pink flip-flops to match her dress. Alexis had her curly red hair pulled back in a scrunchie, and she wore a light blue tennis shirt and jean shorts with white sneakers. And I might as well tell you what I was wearing: a yellow T-shirt from my cooking camp signed by all the kids who went there, ripped jeans with iron-on patches, and bare feet, because I was in my house, after all. Oh, and I painted each of my toenails a different color when I was bored. “Mia! I missed you!” Emma cried, giving Mia a hug. “So how was your first vacation with your mom, Eddie, and Dan?” Alexis asked. Eddie and Dan are Mia’s stepdad and stepbrother, respectively. Laid out on the table was a bowl of bright green guacamole, a platter of enchiladas with red sauce on top, homemade tortilla chips, a pitcher of fresh lemonade, and a plate of tiny cupcakes, each one topped with a dollop of whipped cream and sprinkled with cinnamon. My friends gasped, and I felt really proud. Then my mom walked into the kitchen. She has brown hair, like me, but hers is curly, and today it was all messy. She looked tired, but I thought maybe it was because she had patients all morning. She’s a dentist and has to work a lot. “Shmpf,” I replied. Actually, I was saying “sure,” but my mouth was full of guacamole. Alexis took a chip and dipped it in the guacamole. “Guacamole-and-jelly sandwiches for lunch,” Mia said, giggling. “I think I’ll stick to guacamole and chips,” Alexis said matter-of-factly. Then she wiped her hands on a napkin and opened up her notebook. Alexis loves to get down to business at a Cupcake Club meeting. “I like it,” I said. Emma and Mia nodded in agreement. Mia looked thoughtful, and I couldn’t tell if she liked the idea or not. I decided to change the subject. If Mia decided she was interested, she’d bring up the idea again. Sometimes Alexis can get a little pushy when she wants the club to do something. Which is mostly good, because otherwise we’d never get anything done. When I first started middle school last year, Sydney Whitman made my life miserable. So I didn’t feel bad about making fun of her—well, not too bad, anyway. My grandma Carole says that two wrongs don’t make a right, and she’s got a point. But Sydney really made my life miserable. I started jumping up and down and waving my hands in the air. “Look out, everyone. Katie’s doing her happy dance,” Mia said. I felt like a balloon that somebody just popped. One of the reasons Sydney made my life miserable last year was because she took my best friend, Callie, away from me. Yes, I know that nobody forced Callie to dump me and become a member of the PGC. But it was always easier to blame Sydney than to get mad at Callie. Callie and I have been friends since we were babies. Oh, and the Popular Girls Club is just what it sounds like. It’s a club Sydney started where they invite popular girls to join. They do everything together. I started to get so mad just thinking about it, then I realized Mia was talking to me. “So Callie didn’t mention any of this to you?” Mia asked. I know I shouldn’t get so freaked out about Callie. If she hadn’t dumped me, I probably never would have become friends with Mia, Emma, and Alexis. There would be no Cupcake Club. But something happened to Callie when she got into middle school. Sometimes she could be not so nice. So it was probably for the best that we weren’t friends. We saw each other when our families got together—our moms are best friends, and, yes, that gets really weird—but that was about it. Anyway, I must admit, there was a little part of me that hoped, now that Sydney was gone, that Callie would be friends with me again. I imagined her showing up at the front door. Oh, Katie, I have treated you so badly, she would say. Can I please join your Cupcake Club? Of course, I would say, trying to be the better person. I forgive you, Callie. Maybe Alexis had the right idea after all.